*This post contains affiliate links to products that I use. If you purchase through the link I've provided I will receive a commission at no extra cost to you. If you'd like to support me I'd appreciate it a lot, but no hard feelings if you don't want to. If you're interested in using Keysearch use the code KSDISC to get 20% off! One of the most exciting things about having a blog is getting traffic. Traffic means readers, which means an audience that's interested in what you have to say. Exciting, right? But decent traffic is still something many bloggers struggle to generate, no matter how great their content is. One of the most effective ways to gain long term traffic is through organic search - and by that I mean search engines like Google. In order to get that traffic, you'll want to conduct some keyword research to find out what people are searching for, and decide whether you can write about it on your blog. In this article, I want to show you that it's not as hard as you might think to perform keyword research and that it can actually be quite fun. 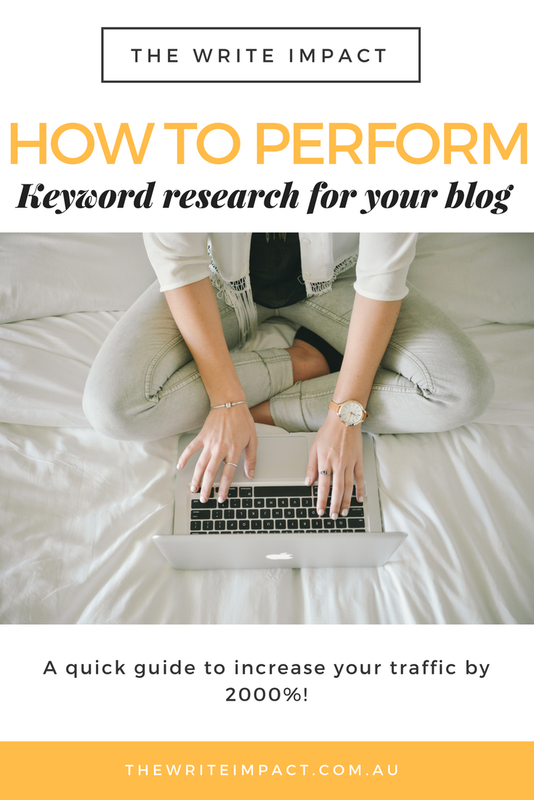 I'm going to go over the steps I take to perform keyword research and hopefully you'll learn a thing or two! Choose a topic you want to write about. Even if it's just one word that you've decided on, have something in mind that you want to communicate to your audience. As an example, let's say you want to write about succulents on your gardening blog. In this step, I'm going to filter the results to show only phrases that are more than four words long (these are known as long-tail keywords). I've decided on four words because typically people type in long questions into Google that are around four words or more. Click the tab that says "volume" to sort through the most searched phrases from high to low. On the left, you'll see the tab that says "score". This score shows you how difficult it is to rank for the term. If it's in red it's hard (many websites are already competing for it), while light green is easy. Orange means it presents a medium challenge. The ones in this example are orange, so they present a reasonably good opportunity. In order to find easy to rank keywords, you can also filter by score. In this example we can see that "succulent plants for sale" has a high search volume and relatively easy score, meaning you might have a good chance at ranking. However, for the purpose of blogging it might not be a great term. The others we have are "how to grow succulents", "best way to grow succulents indoors" and "how to care for succulents indoors". These are all great article ideas for this topic. When you're happy with your keyword list, it's time to download it! You can either manually note them down or download your CSV file with all the available data. You can use a spreadsheet or whatever you feel comfortable with. Now that you are armed with the right keywords, it's time to write your article! Include your keywords sparingly (limit to 2-3 times in the article body) but make sure you add your keyword in the title of your post. One tip I would recommend is to Google the phrase you are trying to rank for, and check out the first result. Your goal should be to create an even better content piece than that site and make it incredibly useful and informative for your audience. With any luck, you will see your ranking soar and traffic come in no time. No spam. We hate that stuff too.